Storage facilities are a constant for any construction project. The type and location of your storage facilities are variables that make a big difference in the cost-benefit equation. This was certainly the case for one Mahaffey client, Ancos — a leading provider of polymer enhancement and finishing services. Ancos cut their storage costs by approximately 66 percent and improved business flexibility when they moved their off-site storage to an on-site temporary warehouse. Valentin Alvarez of Ancos took a few minutes to talk to us about how Mahaffey temporary warehousing cut storage costs and improved their project bottom line. Why were you looking for a temporary structure? A majority of our storage materials were off-site—about 30 minutes away from our operations. The ancillary costs of off-site storage—in addition to the monthly fee for renting—had become significant. We were leasing warehouse space by the pallet, meaning we were charged for each 4x4 space our materials occupied. Other costs included the in-and-out fees charged by the storage facility, transport costs, and peripheral costs associated with the time and labor to travel to and from the storage site. We had been using off-site storage for about two years, and, as these costs added up, it was clear we needed to look at on-site storage to optimize our budget. Did you consider permanent construction of an on-site warehouse? I realize Mahaffey may not be the only provider you spoke with. Why did you choose a Mahaffey temporary structure? Mahaffey was the second company I contacted and the only company I found to be serious about customer support. Mahaffey adapted quickly to our needs with a custom solution—not just a cookie-cutter offering. The structure components were in stock in their warehouse, meaning we didn’t have additional lead-time to contend with. Mahaffey has been incredibly responsive since my first contact with them, and all the way through the project. Dealing with Mahaffey has been a great experience—the process has been simple and the customer service has been world-class. Tell me about communication with Mahaffey throughout your project. The Mahaffey team is attentive and very serious about their work (and our project). The team came to our site to conduct a walk-through, and we reviewed our ideal layout. Mahaffey did a thorough examination of our site and talked us through possible solutions. At our next meeting, they presented the ideal custom solution for our project. From there, we had weekly check-ins leading up to the installation to discuss any updates or changes, and we checked in daily during the installation. The entire process was transparent and smooth. The final structures for Ancos needed to be at least 50 feet wide and meet snow load and wind load requirements for the area. The temporary warehouse solution was two MTS™ structures, each with a peak height of 34.5 feet. The structures were installed on site on an asphalt surface the client poured. The structures were available in Mahaffey’s inventory and ready for immediate dispatch. Hidden costs and complications don’t have to threaten the success of your next project. 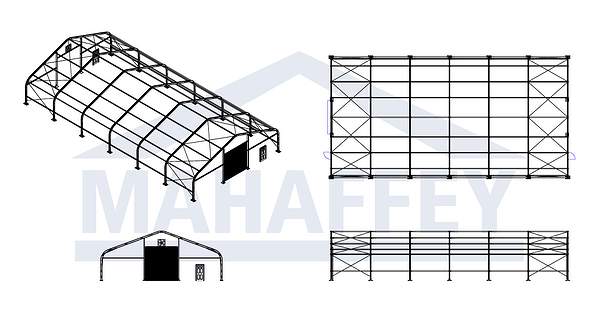 Temporary structures keep your crews working efficiently with supplies and equipment stored closely to your site. Is it time to find a better storage solution for your operation? Talk to one of our expert project managers today.